La Dismantler has been supplying top shelf parts to our customers for all types of aplications. Here is what they had to say about the car. "The Bisimoto 911 cab blurs the lines between classic beauty and modern technology by modifying a 1981 Cabriolet to an ultra wide-body custom 530hp Porsche Carrera. Using the latest performance electronics, a 3.0L air-cooled twin turbo powerplant, and a 5-speed gearbox were utilized to create the ultimate “military themed” street monster. 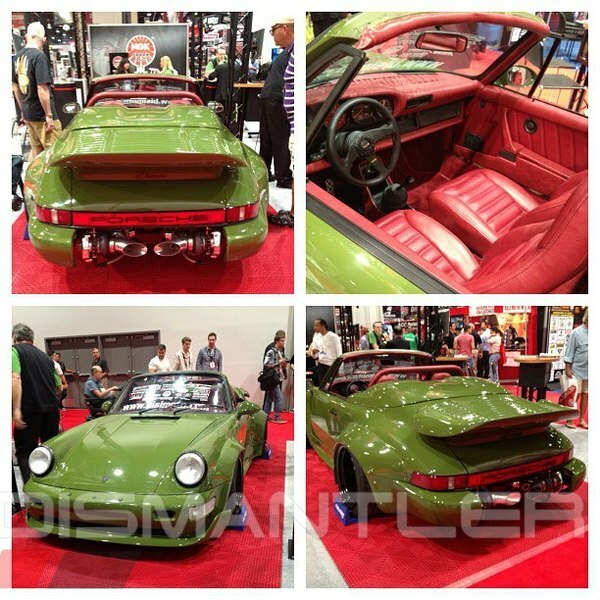 The goal of my build was to combine the best 911 elements of the old, with the new. The electronics are amazing, as I used an AEM Series 2 EMS with drive-by-wire technology, and full CAN BUS protocol. Even the engineers at AEM are shocked that we got it to work so well. We also upgraded the cylinders, made custom rods, and used custom Arias forged pistons with a mil-spec harness. The purpose of the build was to build a street-able race-spec vehicle, and to explore the strengths of a unique electronics and chassis combination. The most challenging aspect was the setting up the unique engine management drive-by-wire systems, and the Bisimoto team succeeded with flying colors. The plans are to take the vehicle for some high speed runs, and also perform some testing at the local drag strip and road-race courses. There has been some huge interest in purchasing the vehicle by Porsche enthusiasts, and we will let her go, or replicate her…for the right price. This is the flagship race car, being built for full competition. Goal: 800+whp.